Potty training a toddler is an exciting, yet daunting, task. Ask 100 people how it went for their toddler, and you’ll get 100 different stories. From those whose toddlers just magically got up and went potty on their own one day, to those whose toddlers refused to move those bowels without a diaper on. In this Jam, I’d like to share some of my own thoughts and experiences on the rite of passage from diapers to underwear, and offer up some ideas and tips that I learned while potty training Smarty Pants. Things went fairly smoothly with Smarty Pants. He started potty training around the age of two. One of the biggest contributors to the ease with which he was potty trained was those good old cloth diapers. With cloth diapers, kids can feel the wetness of their pee, so they learn to associate the feeling of needing to go pee with the wetness. Without cloth diapers, kids don’t necessarily realize that they are peeing, because they don’t feel the wetness. In some cases, they don’t even know that pee is wet! In the early stages of potty training Smarty Pants, we found that if he was really caught up with what he was doing (e.g. playing a really exciting game, or with a good friend), he wouldn’t realize that he had to go pee, until the pee was coming out. Imagine if he was wearing an ultra-absorbent, disposable, diaper in the same situation. He wouldn’t have realized that he was peeing at all. 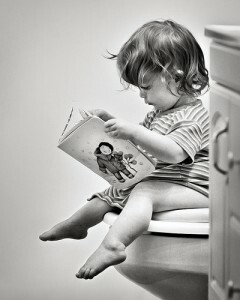 This is why I believe that a key factor in potty training is helping the kids to realize that they are peeing. I’ve talked about “Number 1″ (pee) until now… but what about the dreaded “Number 2″? Well, Number 2 took a bit longer to train, but overall, same concept. Kids need to build the immediate association with the feeling of needing to go poo with the realisation that they have just pooed. I notice how some kids with diapers can poo in their diaper without even batting an eyelash. They just keep on keeping on with whatever they were doing, perfectly oblivious to the you-know-what sitting you-know-where. By the time diaper-changing time comes around, the association is lost. For us, switching to underwear really helped to build this immediate association. a) they don’t want to just start using cloth diapers all of a sudden (which is understandable – you don’t really want to be investing in cloth diapers a month before your toddler is potty trained – you won’t get enough use out of them to justify the cost). To these parents I say, if you are going to have another, consider using cloth diapers. You will save money and the environment, and you will likely potty train your him or her sooner. b) they are afraid to switch over to underwear (“oh my, what will happen to our beautiful, white, Persian carpet!!”). Roll up the white carpets. First thing first – secure your valuable carpets in a safe place. It will help take the edge off. Prevention is key: look for the tell-tale signs. If you notice your toddler is starting to do a little dance, or is making a strange face, grab him and run him over to the potty. Be reassuring. If you couldn’t prevent an accident, don’t make a big deal about it, and give some reassuring words. Stay positive. Know that you will have accidents, but also know that there will be fewer and fewer accidents every day. You will get there soon. And when she does go on the potty, give lots of praise and positivity. Take it on the road. For a boy, you can carry a bottle around with you, and for a girl, a bottle or container with a wider opening on top. When the signs of an imminent pee-pee are present, and you don’t think you’ll have time to make it to a toilet or the potty, take your toddler to the side, whip out the bottle or container, and let them him or her pee in there. (Warning: if prudish people see you doing this, they may look at you funny… but hey, they probably don’t have kids of their own, so could never understand). Carry an extra set of clothes with you. That way you can get him into something dry ASAP when an accident occurs – especially if you are taking it on the road. Time is on your side. Keep note of the last time your toddler went pee, and how often he goes pee. If you think pee-pee time is approaching, just run him on over to the potty and sit him there. Also, take note of the usual span of time between when your toddler drinks something and goes pee. For “Number 2,” consider whether there is a usual time of day when she makes the movement. When that time approaches, sit her on the toilet to see if she goes. Play dates call for extra vigilance. As mentioned earlier, if your child is really distracted because she is playing contentedly with her best friend, she is less likely to notice the signs that she has to go potty. So, be aware of that, and look extra carefully for the signs and times that she might need a trip to the loo. And there you have it – my thoughts on potty training. All of these ideas worked for us, so I hope you try some of them out for yourself (if you are ready and willing). Overall, your child will potty train eventually, so don’t over-force things, and only do it when you feel that you, and your child are ready. If you have any additional thoughts, advice, or stories from your own experience, please share them here by leaving a comment! Flickr photo courtesy of thejbird. Return to Parenting – The Dad Jam Home. Hey guys. Love the site. I vividly remember doing the potty training thing with my first son. My wife was given a book about how to do potty training in a single day by some evil friend. It was horrible! I’m just getting started at this blogging thing myself (http://dadicals.blogspot.com), and I appreciate the great content and useful information that you guys always provide! potty training , for me, is really difficult. My youngest will be 3 this coming april and yet he still pees on the floor! I get so frustrated every time he does that. Sigh! Hi Naomi, yeah, it is difficult, and it is frustrating, we went through the same. Keep looking for those signs (e.g. “the pee-pee dance”). Also, just keep remembering that the accidents will stop soon! Best of luck! Hi JK, thanks for the kind words and your comment. Potty training in a single day? I can’t see how that is possible, so I agree, it must have been horrible! Good to hear about your blog. It is always good to see more dad bloggers out there! Good luck with it and I will be checking it out! The potty training tips suggested by you are very helpful. Thanks for posting. Thanks Kate, glad you found the tips helpful! We’ve noticed that potty training comes in fits and starts. Our oldest seem to take to the potty very early and very easily (18 months). Then she came to a stage where she didn’t want to have anything to do with it. I chalk it up to the arrival of our second child and the regression issues that everyone talks about. I’m happy to finally report though that as of this comment, our oldest seems to have finally negotiated the training stage. Thanks Denis, and I think you are right. We noticed some off and on periods for Smarty Pants too, also around when our second one was born too. That is great that she started taking to the potty at 18 months though! With our second one, who is now 8 months, we have been trying a “diaper free” approach, which is interesting and seems to be working… once I get some more experience with it I will definitely share my thoughts and experiences on the whole thing here! I’ve potty trained 3 children now and all i can say is that videos and books are a godsend. It really depends on the child some just prefer a book. I’ve tried a few videos like once upon a potty, and such but they are just too outdated. However, i was searching the net and i came across the magic bowl. I linked it above. It was 12 bucks and i can honestly say it was worth every penny. It’s a musical about potty training. The kids all watch it and potty training seems to have turned into a marching band at my house. Anyways thats just my two cents. @Potty Training Guru – that sounds pretty funny! Thanks for sharing.